Estate Planning & Administration partner Alex Tanouye donated his time to A Wider Circle this weekend. A Wider Circle works to end poverty one family after another with the aim of giving everyone the chance to succeed. 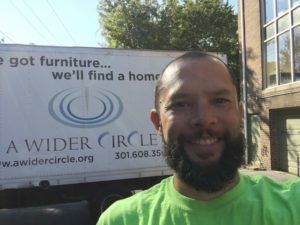 In addition to serving on the organization’s Board, Alex also regularly volunteers with the group like he did yesterday, driving trucks or offloading donated and household items into the warehouse, where these items are later inspected, reassembled when necessary, and then taken into the showroom where the organization’s clients come to select what they need to furnish their apartments. It’s just one more example of how Pasternak & Fidis, PC gets involved in its community.